stro-Vision's Professional Free Bengali Astrology Software now includes the feature 'Free Horoscope Matching'. It offers a variety of chart formats such as North Indian, South Indian, East Indian etc. which lets you generate free horoscope reports as per your requirement. This Free Bengali Astrology Software suited for Astrologers and Astrology Students provides a huge database of the cities around the world. You can add new city details to this database too. 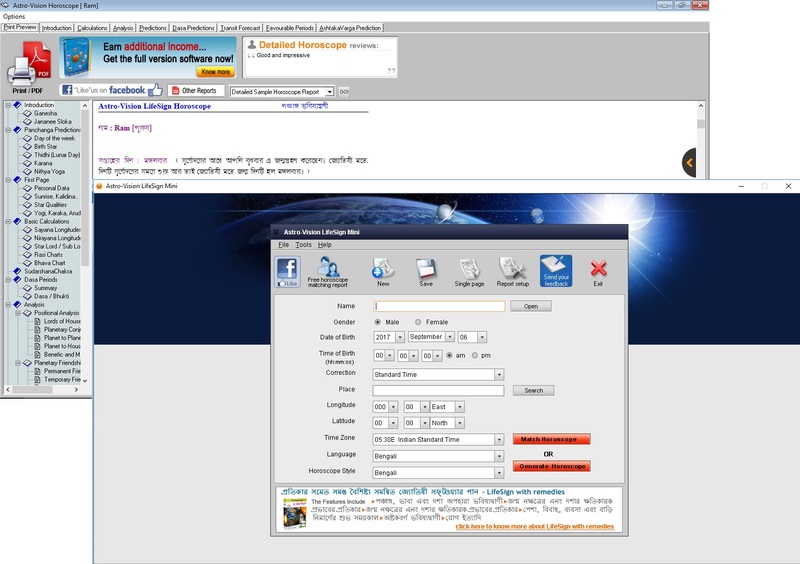 Various ayanamsa settings such as Raman ayanamsa, Chitra Paksha ayanamsa or Lahiri ayanamsa, Thirukanitham ayanamsa and Krishnamurthy ayanamsa are included in this Free Bengali Astrology Software. Panchang predictions, detailed Bhava predictions based on the influence of planets on your life &character are also covered. Free Bengali Astrology Software analyses the first house, for predictions on personality, status and physique. Entire charts, calculations and analysis in this Free Bengali Astrology Software are based on Vedic Astrology. Details of the Dasa and Apahara (Bhukti) are included in this software with details of the arambha and anthya for each Bhukti/Apahara within each Dasa period. A brief report based on the effect of the current Dasa &Apahara is also included. The software calculates the birth star and gives a list of associated star qualities. The dasa and dasa balance at birth is included with the rasi chart. The software tells about the combinations that result in yoga and its effects. A brief summary of Vimshottari Dasa Periods, Bhava chart, Sudarsana chakra chart etc. are also presented. Start using this Free Bengali Astrology Software. 1. Added Rahu and Ketu dosha predictions. 2.Added Oriya language.